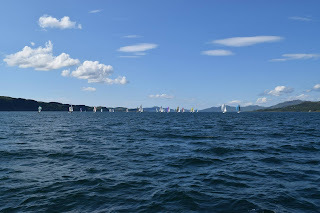 OBAN Sailing Club’s 2015 Round Mull circumnavigation was a race of complete contrasts and winds varying from zephyrs to a full gale on Saturday. 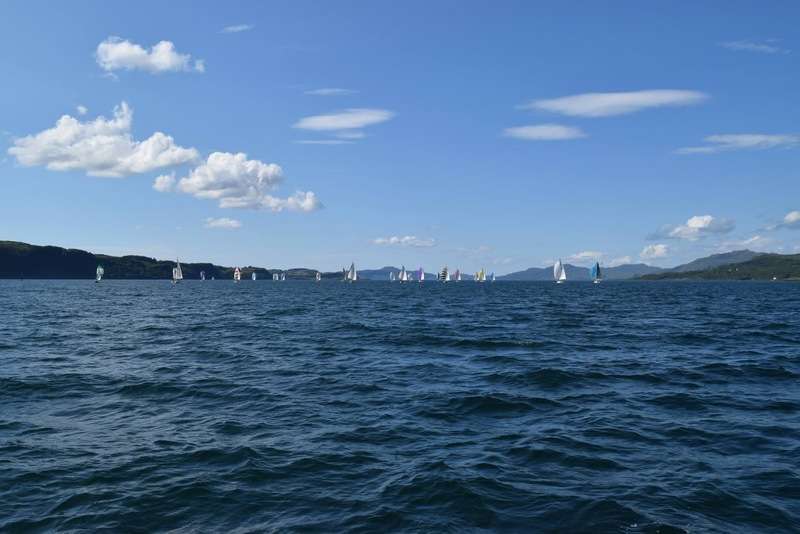 Sponsored by Owen Sails and Ardfern Yacht Centre, the island circumnavigation of around 100 miles had an entry of 41 boats and the Friday start off Oban Sailing Club looked promising with a steady breeze in the Bay. However outside in the Firth of Lorn it was a very different picture with windless conditions prevailing to Lismore Light. Principal Race Officer George Seaton opted to take the fleet out to start near the Light but with a lack of breeze had to motor further north to Fuinary before starting the four competing classes. A short race to Tobermory Bay was better than none at all and the wind filled in to a moderate breeze with a run all the way. 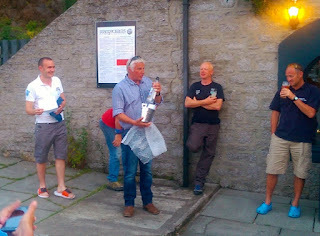 It was to be Brian Wiseman’s Sorr of Appin that took the coveted Mishnish Bucket for the best corrected time of the fleet. 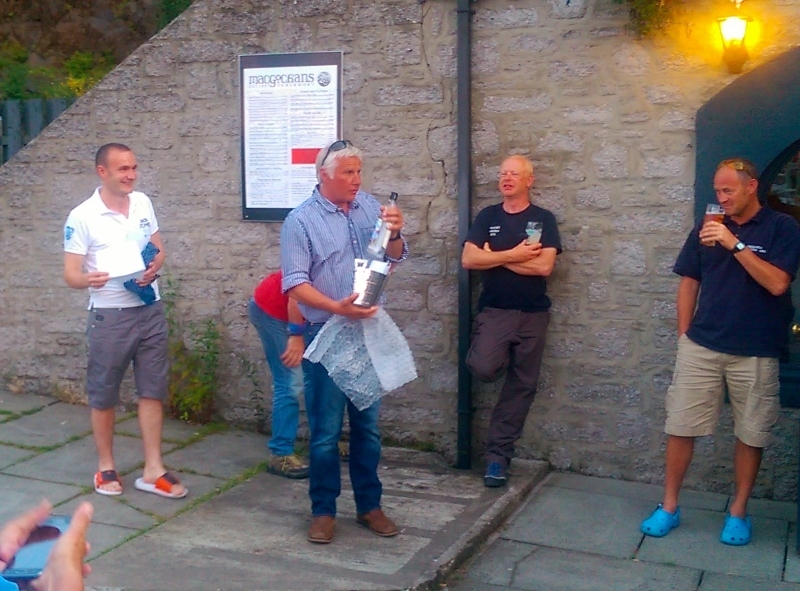 Brian and team, which included Mark Cameron of co-sponsors Ardfern Yacht Centre, also won Class 2 with John MacKenzie’s Stoirm Mhor second and Colin Crawford’s Dehler 32 Nimrod third. In Class 1 John Fraser’s Dufour 40 Wookie II was first with Scott Chalmers in Sunrise, the Sigma 400, second and Ewan Mackenzies’s Elan 40, Ceol Beag, third. Class 3 was won by Marian Austin in Scintilla of the Sea from Lochaber Yacht Club with Oban’s Derek Greer and team in Al Harija second and Iain Gibson’s Nicholson 32 Tegumai taking third place. Alan Gent-White’s An Sulaire took the restricted sail class with Paul Moorhead’s Tupelo Honey second and Brian Robertson’s Celtic Spirit third. Saturday dawned breezy with a run for the fleet from Tobermory to past Caliach. 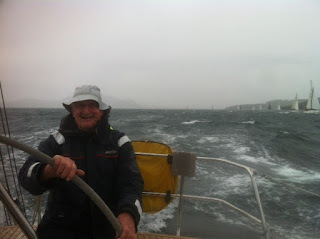 The building breeze saw challenging conditions with spectacular broaches and some retrials back to Tobermory. After kites were dropped for the long beat into Bunessan the breeze was gusting up to 40 knots and some sails blew in the building breeze. In the slow handicap class it was the Moody Whigmaleerie of Donald Philips that revelled in the conditions to take first place with Scintilla of the Sea keeping the results up with a second and the Contessa 32 of Alistair Pugh in third. Sorr of Appin sealed another victory again making light of the conditions with Amber Haze second and Colin Crawford’s Dehler 32 Nimrod third. Fast class honours went to Sunrise with Requiem placed second and Roxanne from Skye third. In restricted sail it was Mystic Sun taking the honours with Celtic Sprirt second and Ionare third. The majority of the fleet made it to Bunessan where the village hall committee laid on an excellent buffet and entertainment raising funds for the Ross of Mull Historical Society. The last leg of the race on Sunday saw a brisk spinnaker start with the fleet on a run to the Sound of Iona, then a tight reach through the Torran Rocks. The wind held for the majority of the passage until a mile or so from the finish at Frank Lockwood’s Island. Frustrating conditions prevailed as places were lost and won in the last hour or so of the race contending not just lack of breeze but a strong and adverse tide. Sorr of Appin came through to complete the hat rick of three firsts and lift the overall Bank of Scotland Cup for the medium class handicap yachts. In second place on leg 3 was Sarah with Alan Moore’s Delinquent third. In the slow handicap class Marisca won from Scintilla and fellow Contessa 32 sailor Mark Hillman in Milly Brown in third. This gave the class overall to Marisca from Scintilla of the Sea and Milly Brown. on leg 2 Tobermory to Bunessan. Ionare won the restricted sail class with Celtic Spirit second and Calvador third. This ensured a win for Damon Lindsay’s Dufour 44Ionare overall lifting the Brian Shellcock Memorial Trophy. Class 1 was taken by David Walters with his Arcona 430 Requiem winning the Glencoe Trophy for the best corrected time from Bunessan to Oban, the fastest circumnavigation on both elapsed time and corrected time - the Mull Plaque and the Torran Rock as well as the fast handicap class – the Antique Schweppes Trophy. The Bilgewater Shield for the fastest circumnavigation on corrected time went to Kevin McGrath’s Calvador. Close racing at the start of the third and final leg. The main trophies are awarded at the OSC prize-giving in November.